We’d love your help. Let us know what’s wrong with this preview of Blowback by Christopher Simpson. To ask other readers questions about Blowback, please sign up. Does anyone know how I can find a copy in the UK? This is the second book I've read by Simpson and maybe the third about the connivance of agencies of the federal government with Nazi war criminals. Although previous study had prepared me for the general themes taken up by the author, none of the others had so impressed upon me the extent of such cooperation, both in terms of the numbers involved and the numbers, the victims, affected. Additionally, no other such book has made such a strong case against the CIA and cooperating agencies for effe This is the second book I've read by Simpson and maybe the third about the connivance of agencies of the federal government with Nazi war criminals. Although previous study had prepared me for the general themes taken up by the author, none of the others had so impressed upon me the extent of such cooperation, both in terms of the numbers involved and the numbers, the victims, affected. Additionally, no other such book has made such a strong case against the CIA and cooperating agencies for effectively harming the interests of the USA in both the short and long term. This book was written in the aftermath of the Iran-Contra scandal. Although the text focuses on the period from 1945 to 1959, connections are drawn to events from that period to the actions of the Republican Party and the Reagan administration in the eighties. Those who do not learn from history are doomed to...umm I forget and so does just everybody else...that or they haven't read the books like this. Intriguing read that could would be an eye opener to the average American or just another shake of the head in disgust by the more educated. Depressing yet necessary look at the American use of Nazi collaborators during the Cold War and its disastrous effects on both foreign and domestic policy. This is one of the books that comprise the “Forbidden Bookshelf” edited by Mark Crispin Miller for Open Road Media. There are six or seven books in the series, each of which is purported to be a book that the ‘Government’ would rather keep out of continued publication. This would be great if it were true, but if the US government is afraid of this book, anyone who is part of that type of work should be sent to run the US AID library in Kabul or Bagdad. Keeping in mind that this book was first pu This is one of the books that comprise the “Forbidden Bookshelf” edited by Mark Crispin Miller for Open Road Media. There are six or seven books in the series, each of which is purported to be a book that the ‘Government’ would rather keep out of continued publication. This would be great if it were true, but if the US government is afraid of this book, anyone who is part of that type of work should be sent to run the US AID library in Kabul or Bagdad. Keeping in mind that this book was first published in 1988, much of what is in this book is so dated as to be ‘forgotten history’. You could learn more about what is in this book by watching old episodes of “60 minutes”. It mostly exposes the CIA and State Department use of ex-Nazis, Nazi collaborators and other ‘fellow travelers’ in the 50s and 60s to run and fund anti-communist groups in Eastern Europe. Not only as spies but also as recruiters to work in the ‘captive nations’; to cause problems for the new communist governments and the Soviet Union. It shouldn’t be a surprise to anyone who realized that this is what we have done all over the world since the end of the Second World War. Much of the underground movements that we have backed during and after the Cold War, were members of local fascist type or anyone who claimed to be anti-communists. This can now be confirmed by our one time backing of Muamar Khadafi, Sadaam Hussein, Anwar Sadat, the ISI (the secret military police in Pakistan) and the Mujahadeen in Afghanistan. All of this traces back to the Dulles brothers before during and after WW2. John Foster Dulles (Secretary of State) and Allen Dulles (co-Head of OSS, and then the CIA) were the spearhead of American conservatives during the early Cold War. Both of them were super-patriots and felt that anything they did was for the betterment of the country. They didn’t care who they worked with or what they did as long as it helped ‘national security’. So backing a few sadists, murderers and psychopaths was par for the course. If you wonder if this works, look at what happened in Iraq when we decided that all of the Iraqi Officer Corp and the leadership and management of the Baath Party would be purged from the Iraqi government. Many of the ‘terrorists’ who are Taliban and ISIS and other guerilla leaders can be traced back to these men who were purged. So even if they are ‘scum’, it would appear that it’s better if they are ‘our scum’ then sent off to be independent contractors to the nearest rebels. Read it as an historical document. fine bit of dragging the waters. details paperclip, bloodstone, and other operations. explains how the gehlen group was folded into the early CIA. points out that a number of persons who should've hanged were hired. US cold war policy as virtual continuation of NSDAP eastern front doctrine. Excellent book, but it made me so angry that I wasn't able to finish reading it. Instructive, particularly as we seem unwilling or unable to learn from the mistakes which it thorougly and carefully documents. Reading Blowback by Christopher Simpson made me ill and very angry - and convinced me that every American should read this book. Even better, it should be a text book in High School and College U.S. History courses. Blowback refers to the unintended adverse results of a political action. 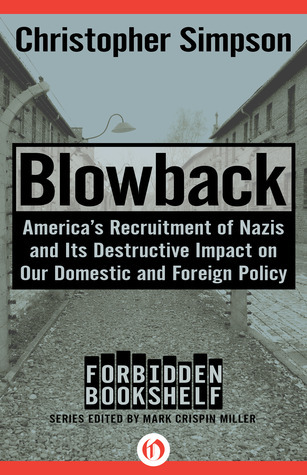 In this case, employment by the United States Intelligence Services of tens of thousands of former Nazis - members of the SS, German Army, and Nazi government who were directly linked to the killings of millions Reading Blowback by Christopher Simpson made me ill and very angry - and convinced me that every American should read this book. Even better, it should be a text book in High School and College U.S. History courses. Blowback refers to the unintended adverse results of a political action. In this case, employment by the United States Intelligence Services of tens of thousands of former Nazis - members of the SS, German Army, and Nazi government who were directly linked to the killings of millions of individuals. Immediately after V-E day, the U.S. became obsessed with the USSR and the fear that Communism was going to spread rapidly. Many in the government became convinced that WWIII, complete with the use of the new A-Bombs, would start within six months and plans needed to be ready immediately. They figured that former Nazi scientists, military personnel, propaganda experts, and secret police could be used to prepare ourselves for this conflict. Secretly, and often illegally, intelligence organizations, including the newly formed OSS/CIA, recruited tens of thousands of "former" Nazis. Many were secreted away from the Nuremberg Commission and British and Russian war crime boards and brought, surreptitiously, into the United States. Bankrolled via government funds funneled through Radio Free Europe and other "private" organizations, intelligence groups, political committees, and military units were formed. The famous Green Berets owes their existence, and head gear, to these groups. Assassination squads, guerrilla warfare groups, and propaganda machines were setup, all with the goal of destabilizing the USSR and stopping Communism. Joe McCarthy was just a "drop in the bucket" compared to the secret organizing done using Nazis in the name of democracy. And, even more alarming, organizations formed by these groups are alive and well influencing our current government's foreign and domestic policy. This book brought light to the controversial US policy. It proves, in my opinion, how imperialistic USA is. You will find the kinds of nefarious and sinister people our government worked with to fight the Cold War to be shocking! If even half of this book is true it is frightening. Christopher Simpson is a veteran reporter, historian, and analyst who teaches at American University's School of Communication in Washington, DC. His work has won national awards for investigative journalism, history, and literature, and has been published in more than a dozen languages. Current study includes technology, democracy, revolution, and peer learning.